August Stepan was born in Vienna on 3rd February 1915, studied mechanical engineering for three years at the Vienna University of Technology, waiting for an opportunity to study aircraft design. In November 1935 he was awarded a scholarship to the technical university in the free state of Danzig. (In 1935 there were only two places one could obtain a diploma for aircraft design, i.e. Danzig and Berlin). After 5 years, he obtained a diploma and in September 1940 I was offered a position in the "Wiener Neustadter Flugzeugwerke", a production plant of Messerschmidt Augsburg producing the ME 109 Fighter aircraft. After a few months there, Stepan met a young mechanic (Dip!. Ing) Baron Friedrich von Doblhoff. He presented to Stepan, the "aviation expert", his idea: a torque-less helicopter with tipjet-driven rotor with small tipjet combustion chambers. Those were fed by a fuselage­ positioned engine-driven compressor with high-pressure air and fuel injection. The air and fuel were channeled through the spar of the rotor blades. These tipjets had to be as small as possible in order to allow the rotor to autorotate in case of engine failure and thus allow safe landing. Therefore, they had to operate with the highest possible fuel/air ratio, i.e., 1: 14 at over 2000 degrees Celsius at a combustion intensity four times that of normal jet/engine combustion chambers. These were operating with a 1:60 fuel/air ratio and jet temperatures that could be sustained by the turbine blades. Two other young engineer graduates, Count Alexander Czernin and Theodor Laufer, both of the Vienna University of Technology, and a detail draughtsman, Mr. Vordren, joined a group of inventors headed by Baron Friedrich von Doblhoff. None of them had ever seen a helicopter or a combustion chamber before! Doblhoff went to Berlin, presented his idea to the German Air Ministry (UDET and General Milch) and obtained a development contract for a small helicopter unit to be used for submarine warfare. Their development group, EAST, worked completely independently of the production plant in Wiener Neustadt without any help from outside. Between 1941 and 1943, a group comprising 8 to 10 workshop people, successfully produced tip-operated helicopters for purely experimental flying with tipjets that they had developed. 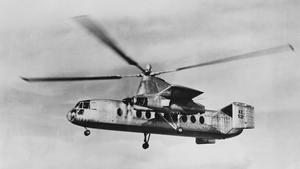 The first and second, WNF V-1 and V-2, with 60 PS and 80 PS engines, driving a compressor, were pure tipjet-driven helicopters, Model 3 with 100 PS and Model 4 with 126 PS were already compound-helicopters. The developers found fuel consumption of the tipjet to be too high and considered using the tipjet drive only for starting and landing purposes as helicopter, while a decluchable pusher propeller should provide the thrust for autorotative forward flight with a windmilling rotor. Because of his light weight, Stepan was elected to be the test pilot of prototypes V-1, V-2, and V-3. He has never had any flying experience before (besides some gliding plane experience with the aviation club of the Vienna University of Technology). He was responsible for the workshop production and, together with Laufer, for the development and testing of new type tipjet units. Doblhoff and Czernin were responsible for the overall design and Doblhoff was the head of the small group and reported to the Air Ministry only. The first famous flight of a high-pressure tipjet-operated helicopter took place on the Wiener Neustadt airfield in 1943. After the heavy bombing attack, their small group moved to a small subsidiary in Obergrafendorf where the pictures of Stepan's flights with V-2 and V-3 were taken. The V-4, a two-seater combined with pusher propeller, was designed but never flown in Austria. When the war was drawing to an end, the group moved to Zell am See in the spring of 1945 with the intention to test the autorotation forward flight by starting from the mountain Schmittenhohe where a cable railway was available. However, when the group was in Zell am See the war and their work in Austria ended. In Zell am See, Friedrich von Doblhoff became interpreter for the military governor and the US weekly news took films of the V-4 taxing on the lawn of Zeller See. The US intelligence forces, which were looking for us, found us in Zell am See and transported the V-4 to Wrightfield in the USA where the V-4 was destroyed during a tethered ground run. In those days, from 1945 until the end of 1946, all helicopter experts of France, England, and the USA visited the Doblhoff team, inviting them to continue their work on helicopters with tip propulsion. Among the British visitors who visited the group several times were: Group Captain Rogger N. Liptrott from the Ministry of Supply, Mr. Hollis Williams from Fairey, Dr. J.A.J. Benett from Fairey, Raoul Hafner from Bristol, and Mr. Kelly from Bell (USA), an expert from France and the USA with Colonel Lindberg (USA). In conference with British experts in Zell am See they decided that Doblhoff would go to McDonald USA, Laufer to Mr. Morain in France, while Czernin and I would go to Fairey Aviation in England. On 14th January 1947, Czernin and Stepan were collected by two British officers and from Braunschweig (British zone) and a Viking aircraft took them to Farnborrough , where they landed in the evening of Friday, 17th January 1947. There they were collected by a Fairey representative. They had no papers or passports but only letters from M.O.S. and were released by the airport police to the responsibility of the Fairey representative, and were handed a piece of paper saying "that [they] are not allowed to touch British soil". They were taken to a British hotel in Uxbridge however and allowed to move freely over the weekend, reporting on the 20th January at M.O.S. and Home Office and obtained papers without denoting status. After this friendly reception they went to the factory of Fairey Aviation in Southall and were free to move andlook for a place to stay. While Dr. J.A.J. Benett was fully occupied with his Gyrodyne, Czernin and Stepan were under the direction of Captain Graham Forsythe and had two duties: firstly, the preparation of drawings of tipjet units similar to those used on our prototypes in Germany and, secondly, to give advice and make calculations for power plant arrangements as they are described in the jubilee issue before the Rotodyne contract. Later, Stepan had to install a static and rotating test stand for static and rotating thrust measurements of newly developed combustion chambers. The well-known music instrument company EMI, situated opposite of the Fairey factory, objected to the noise of the prototype jets and therefore were moved to the aerodrome in White Waltham where all the jet development for the Jet Gyrodyne, Ultra-Light, and Rotodyne was carried out on static and big rotating test stands. All early flight tests took place on this aerodrome. In 1946, Dr. Benett asked Stepan to give a lecture to the Royal Aeronautical Society on "Tip Propulsion of Rotor Blades". It was to be the first lecture on this subject. Stepan delivered this lecture on 18 pages in a journal of the Helicopter Association of Great Britain at the Aeronautical Society and he became a Fellow of the Society. ln 1948, he was appointed head of the Power Plant and Jet Development Division, directly responsible to Dr. George S.Hislop, Chief Designer. 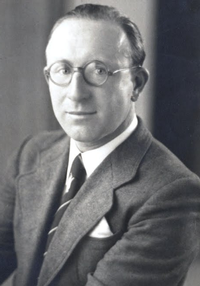 This division had two departments: Mr. Czernin and (after his departure from Fairey) Dr. Leason became head of thermodynamics, power plant arrangement, noise investigation, and Silencer development in Hayes. The second department was under the direction of Mr. Flintoff, responsible for tipjet development, static and rotating test facilities, noise-measuring devices, and static and rotating test stands in White Waltham. In all the discussions with his superiors and Ministry people I stressed the point that this layout of a Compound aircraft lends itself particularly to big aircraft where the weight of the gearbox becomes very important with increasing rotor diameter, but tip speed was limited by the sound barrier. The Jet Gyrodyne (was a modified Gyrodyne originally built by Dr. Bennett. 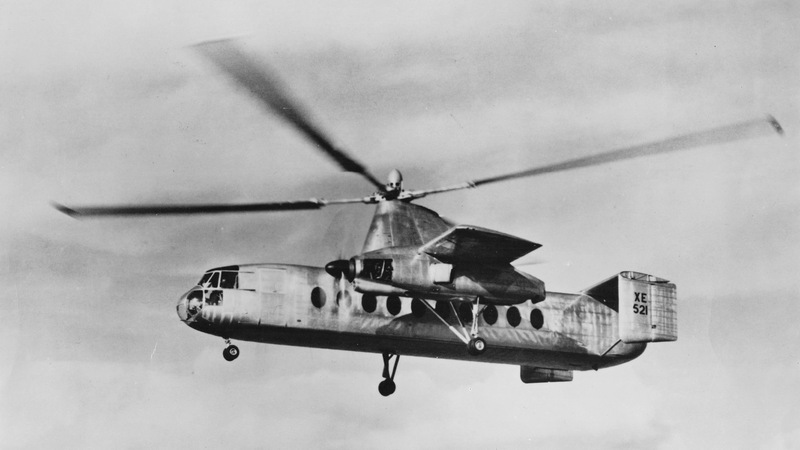 This test vehicle with two propellers, engine-coupled compressor, and two-bladed jet-operated rotor) became the test vehicle for the intended change-over from helicopter flight at starting and landing to autorotation forward flight in the future Rotodyne. All flight testing with the three helicopters Gyrodyne, Ultra-Light, and Rotodyne were carried out with Stepan's assistance in White Waltham where Dr. Leason became flight observer and flight engineer, particularly responsible for the complicated power sharing between helicopter and autorotation forward flight. Near the end of the development, just before the ground-running tests in White Waltham, a big test stand was installed near Boscombe-Down in safeguarded environment. This whole ambitious arrangement of power plants with propellers and decluchable compressors, a 4- bladed tip-operated rotor and cockpit controls were installed full-size and correctly arranged like on the future aircraft. Here, all operational aspects were investigated together with the test pilots. After a lot of ground testing, the first flight, hover near the ground, hover in 300 ft., and forward flight over the town of Maidenhead with two pilots, Dr. Hislop, Stepan, and Dr. Leason as flight observers, took place successfully on 6th November 1957 and was photographed by accompanying aircraft. After Dr. Leason, who was in charge of a great number of Silencers had left the company, Stepan succeeded in the development of a multi-combustion chamber arrangement, based on the shielding effect, buried inside the 15% profile section at the end of the blade. The last results in White Waltham, shortly before the Rotodyne was cancelled, showed 17 db noise suppression, and were witnessed and admired by RAE Farnborough noise experts. The bigger jet units for the last T/RZ Rotodyne with 110 ft. rotor diameter and 60,000 lbs. AUW were also designed and tested successfully with the increased thrust output and recognized by the Ministry when the contract was cancelled on 26th February 1962. At cancellation, it was obvious that August Stepan had played a major development role in the Rotodyne, which has remained the first and only vertical take-off airliner of the world. It could start and land as tip-operated helicopter without torque compensation and after a very short period in helicopter flight, and could transfer to high speed autorotative forward flight. It was ideal for medium distance air transport with no need of large airfields. It never had an accident, it was a unique solution and after almost sixty years there is no vertical take-off fast-flying airliner in the world. After the cancellation of Rotodyne, Stepan decided to go back to Germany. After 16 years with MBB, Stepan retired in 1980. He died in Vienna in 2003. As remembered by a colleague Adam Teleki Bsc Eng, MRAeS in 2018: "As time has gone on, there are only a few of us remaining who knew Stepan personally and had the privilege of working for him. To have flown a helicopter without any significant flying training called for courage, and to develop the engineering of a revolutionary rotor drive system and continue to contribute to progress in three totally different organisations is a measure of engineering skill. To be remembered sixty years after the events is something few of us can aspire to." Dipl Ing August Stepan Test Pilot and Engineer deserves his place in History.